Chaz Aguado has been teaching privately for over ten years in the Baltimore/Washington D.C. area. 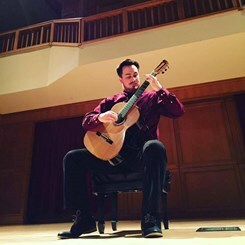 He received a Master's of Music in performance for classical guitar from the University of Denver where he studied with the world renowned performer and pedagogue Ricardo Iznaola. Classical, rock, country, jazz, and blues are among the styles of guitar he can teach to any age; he also encourages all of his students to learn music theory and aural skills for them to become the best musicians possible. You can find him performing at many different venues such as concerts, recitals, competitions, weddings, and dinner parties. Currently he is pursuing a Doctor of Musical Arts (DMA) at Shenandoah Conservatory where he is a graduate assistant. Mr. Aguado has also studied guitar with Laura Husbands, Jonathan Leathwood, Troy King, Aaron Jay Meyers, and Maurice Arenas. Request Lessons with Chaz Aguado today!